Fireflies lit our way as Jim and I rode back from dinner at a biker bar in Williamsport, Maryland, to our damp and buggy campsite, four miles south on the C & O canal trail. By 9:30, we were in our tent, reeking with Deet, eager for sleep after close to 60 miles of bicycling. But, although July 4 was still a week away, fireworks were booming all around, and sleep seemed a long way off. I’d brought along an issue of One Story, a literary magazine that publishes one story per issue, figuring we could read it aloud to each other by flashlight. I got it out, and Jim said he’d be glad to listen, but I’d have to read the whole thing by myself. The story, “The Good Word” by Yannick Murphy, proved easy to read. It was made up mostly of short sentences—the kind of prose, I thought, that would lend itself to being read on the radio. I wondered if it had been. The style reminded me of Ernest Hemingway, or Raymond Carver. The phrases “he said” and “she said” were repeated a good bit more than strictly necessarily—for rhythm, I’m guessing. But the repetitions didn’t stop the story from moving right along. The story was set in an unnamed tropical place reached by ferry. One of the characters reminded me of a guy from whom I’d rented a tent on the beach at Isla Mujeres, Mexico, years ago. 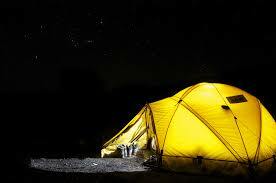 My first night in that tent, I lay awake in the dark listening to some critter outside crawling around the perimeter. At dawn, I awoke to find that the critter was inside the tent, looking for a way out, and I had just spent the night with a scorpion. On the C & O, we were happy to share our tent with a spider that Jim thought might eat mosquitos. Jim held his flashlight steady as I read, and male fireflies cruised our tent, looking for love. I read as if hypnotized, heard my voice as if it were somebody else’s—somebody who lived in the world of the story. In a quiet way, the story turned out to be full of suspense, with surprising twists and a satisfying ending. “I think I was awake for most of it,” Jim told me when it was done. The next morning, we were both still thinking about the story, and what it was about, deep down, though like most good stories, this one was about more than one thing. The author mentioned several of them on the One Story website, but none reflected our thoughts. One of these days, maybe we’ll meet her and ask her. And tell her how we shared her story with the spider and fireflies—and the fireworks. Kathryn’s prose and poetry have been published widely, and she also writes for stage and screen. Kathryn currently lives in New York City, but, having grown up in an Air Force family, has roots in many places, all of which she misses, and suffers from chronic wanderlust.